Unifor Local 444 had been prepared to strike Thursday night, but talks continued past a midnight deadline. Unifor and Integram (Magna) Seating in Windsor, Ont., have reached a tentative agreement, avoiding a strike and the possible shutdown of two Ontario assembly plants. The two parties reached the deal at about 6 a.m. Friday, after bargaining was extended past a midnight strike deadline. Details of the agreement have not been released. Union officials told Automotive News Canada during negotiations that the sticking points were monetary. Under the previous contract, unionized employees at Integram start at $17.33 an hour and use a 10-year salary grid that tops out at $24.76 per hour. About 1,000 members of Unifor Local 444 were set to strike Integram at 11:59 p.m. on Thursday. Both parties remained at the table after the deadline because the union said Integram was "showing forward progress." A ratification vote is scheduled for Sunday at 9 a.m.
A work stoppage at Integram would have likely halted production at Fiat Chrysler Automobiles’ Windsor assembly plant and General Motors’ CAMI assembly plant in Ingersol, Ont. Both rely on just-in-time delivery of 1,500 seats and 10,000 foam seat parts that Integram produces in Windsor every day. FCA builds the Chrysler Pacifica and Dodge Caravan minivans at the Windsor factory, while GM assembles the Chevy Equinox and GMC Terrain at the CAMI plant. The two plants produce a combined 2,500 vehicles each day. James Stewart, Local 444’s first vice president, said work at FCA’s minivan plant could have halted within “a couple hours” if seats stopped arriving from the supplier. A strike became less likely once the union lost a bargaining chip in the 11th hour Thursday. FCA told Unifor it will idle its minivan assembly plant beginning Monday because of an unrelated parts shortage. If the Windsor assembly plant doesn’t operate neither do the local suppliers. 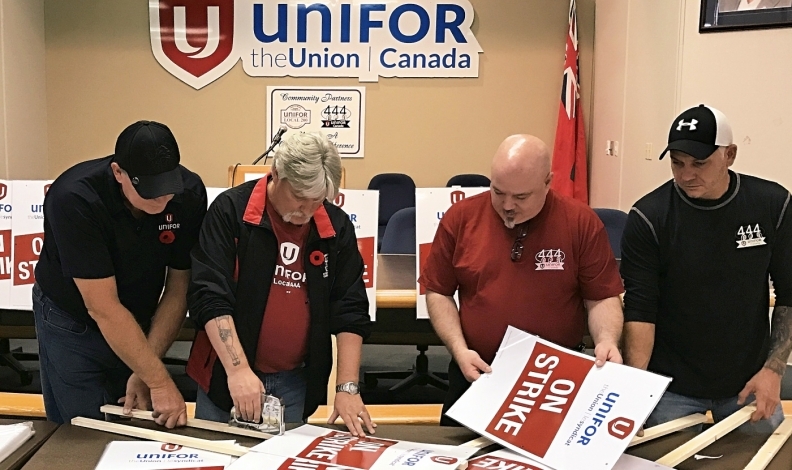 "The reality is that if the [FCA] facility is shut down next week it would be complicated for us to think that we would accomplish anything by going on strike," Unifor Local 444 President Dino Chiodo said Thursday night.